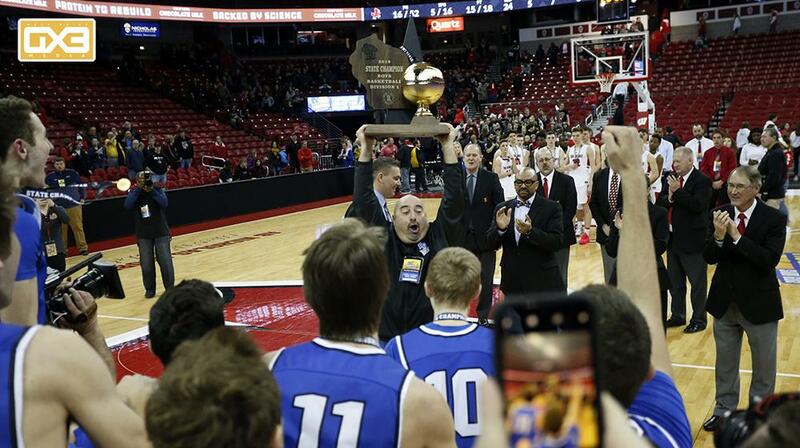 Brookfield Central coach Dan Wandrey naturally loves to see his team get off to a hot-shooting start. He also knows hot shooting is a fickle friend. “We know you can’t depend on it,” he said after the Lancers shot nearly 64 percent from the field to beat Sun Prairie 69-52 and win their first state basketball championship in a game featuring two teams reaching the title game for the first time. On Saturday, though, Wandrey and the Lancers could depend on their hot shooting never going away. They put together a 12-0 run early in the first half, hitting 6-of-7 threes along the way, and never dropped below 60 percent shooting during the game at the Kohl Center. “We have guys who spend a lot of time working on their game and making themselves really good shooters,” he said. “What this team does maybe better than other BC teams is the way we get shots. We share the ball so well and make the extra pass, and get the ball inside. Brookfield Central grabbed a double-digit lead for good midway through the first half and while that didn’t make for a thrilling Division 1 championship, it did make for an impressive display. Add in 14-of-16 shooting at the free throw line and it was apparent that it was the Lancers’ night. Leading the Brookfield Central charge was sophomore forward David Joplin, who finished with 23 points and 13 rebounds. He established himself early, cutting along the baseline and getting cross-lane passes for easy hoops. Sophomore guard Ben Nau added 17 points for Brookfield Central and his brother Cole, a Hillsdale College recruit, finished his high school career with 13 points and six assists. The Nau brothers together hit 5-of-7 tries from behind the arc. It also gave the Brookfield Central trophy cased a new gold trophy for a boys sport, after plenty of near misses in recent years in football. The Lancers have finished second in football five times, including 2017 and 2018.